A man has admitted sending a tarantula spider in a package to a colleague at work in Leicestershire. Mahlon Hector, 22, of Leicester delivered the Mexican red-kneed tarantula in a box addressed to a Marks & Spencer branch. Both the intended recipient, Susan Griffin, and spider were not hurt in the stunt on 28 March, Leicester Magistrates' Court heard. The case was adjourned until next month for sentencing. Hector handed in his resignation after dropping off the parcel at the Fosse Park store and later pleaded guilty to sending a letter or other article conveying a threat. A Leicestershire Police spokesman said: "This was a really unusual case and we took the matter very seriously. "The victim and other employees at the store were extremely shocked by the incident. "The spider may also have suffered and we would have pursued the matter under animal cruelty legislation but it does not cover invertebrates. "The motive seems to have been some form of practical joke with an intention to shock after a professional disagreement between the two." The Mexican red-kneed tarantula is said to be the most common spider used in movies because of its appearance. Large, with a leg span measuring up to 10in (25cm), it has a distinctive dark brown body and legs with reddish-orange leg joints. It is said to rarely bite - but flicks its hairs at victims. 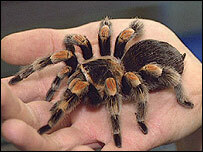 A protected breed, it is the only tarantula on the Convention on Trade in Endangered Species (CITES) Appendix II list.